The 40 Acre Bush at Ararua, near Matakohe, described as “one of the finest patches of kauri in the country”, was actually closer to 1000 acres in size. Its name apparently came from a 40 acre clearing towards the centre of the bush, the result of an ancient forest fire. Worked for its timber between 1905 and 1909, around 22 million board feet of timber was milled from this forest. Mervyn Sterling, the founder of Matakohe’s Kauri Museum, stated that that most of the timber was of “regular size” with only three large trees present, the largest being 45 feet (13.7 m) to the first limb and 48 feet (14.6 m) in girth. That tree was reasonably well known, with a photograph by W. J. Parker reproduced on page 219 of Sale’s Quest for the Kauri. 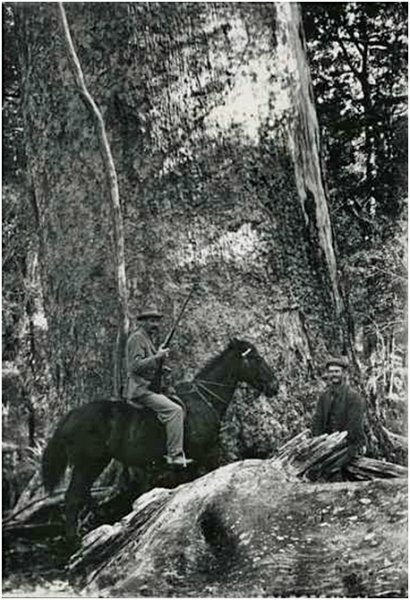 Sale gives figures of 12.8 m (42 feet) for the bole and 15.24 m (converted from 50 feet) in girth – these dimensions were likely from a 1907 Government report on NZ forestry, where Parker’s photograph was used as an illustration. The tree was judged to have 78,750 superficial feet (186 cubic meters) of timber if sound. Yet the tree wasn’t felled for its timber: It was hollow and in poor health. Contemporary photographs show extensive decay on one side of the tree and large fallen branches at its base. In 1906 it was described by the following: “The big kauri tree, reserved by Government in the Forty-mile [sic] Bush, Matakohe, is showing signs of decay, the bark and sap on one side perishing rapidly. This giant kauri has a girth of over 50 feet, and is one of the few great trees that have not fallen victims to the axe and saw. 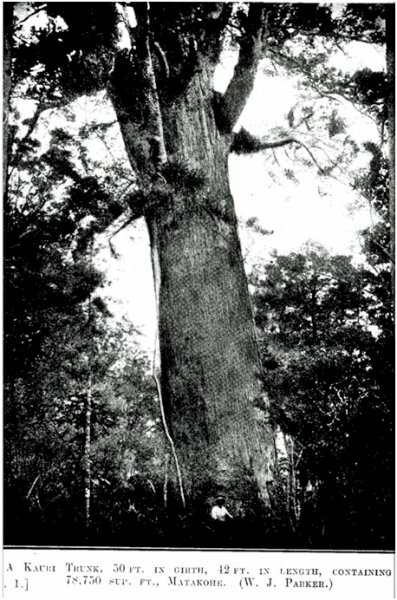 It is doubtless dying of extreme old age”  Comparing the details of the tree (particularly the contour of the rata vine descending on the left of the trunk), it is apparent that the photograph on page 192 of Sale’s book of “…an unnamed and dying giant of the past” is of the same tree. 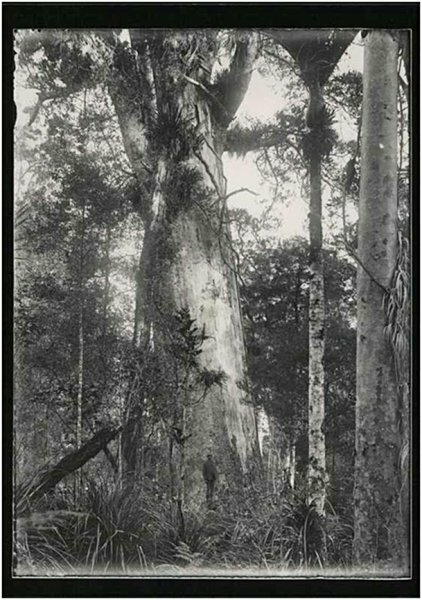 Like many other of the renowned kauri of the day, having escaped the axe, it did not escape the flames, as it was destroyed in a bushfire soon after the turn of the 20th century, one of many that went through the 40 Acre Bush before, during and after its cutting. A. H. Reed, The New Story of the Kauri, Reed, 1964. Clutha Leader, vol. XXXIII, no. 2073, 18 December 1906. Estimate, given description in Sale as "without the head timber " of Tane Mahuta, an otherwise similar sized tree. Photographs show unusually small branching at top of bole for a tree of this size. The actual location of the tree is not known, as the 40 Acre Bush is long gone. The largest remaining kauri tree in the region is likely the Pukekohe Kauri, in its namesake reserve some 5 km to the northeast.